[Editor's Note: As some readers have heard, the National Education Association voted at its Represenative Assembly (RA) to call for the resignation of U.S. Secretary of Education Arne Duncan. A fuller report is at the very bottom of this article, but first we offer readers of Substance the analysis by Susan Ohanian of the way the Times has chosen to cover the major story from the NEA. George N. Schmidt, editor]. 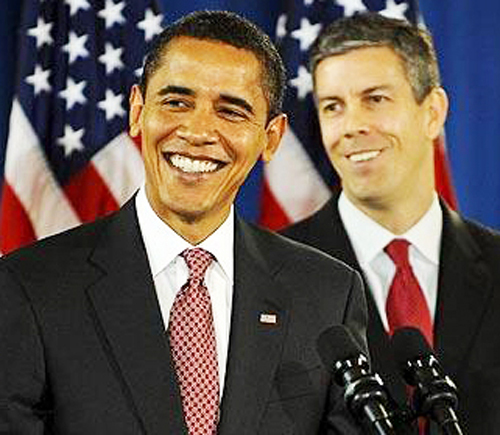 President Barack Obama and his pick for U.S. Secretary of Education Arne Duncan in their younger days. By the time the NEA voted its "no confidence" vote in the Obama administration's education policies by calling for Duncan's resignation in 2014, The New York Times was unable to find any union leaders or rank-and-file teachers in the United States to quote in support of the administration's policies or pick. So they quoted the Astroturf group "Democrats for Education Reform", which is the product of millions of dollars from Hedge Funders and other billionaires who want to milk their last dollar of profit from corporate "reform" of the kind backed by the Obama and Duncan policies. "Departure of Official Is Sought by Teachers" was the headline in article in The New York Times. It didn't mention that the NEA has more than three million members, or that the "official" is a member of the Obama cabinet, U.S. Secretary of Education Arne Duncan. Re: "Departure of Official Is Sought by Teachers," July 9, 2014), I would rather know the reaction of mainstream Democratic operatives to this major teacher union call to dump Duncan than the predictable self-serving rant from the hedgefund financed PAC, Democrats for Education Reform. Ohanian Comment: Could there be a lamer headline? Arne posits the NEA resolution at a convention as "local union politics." And for an informed (sic) comment, the New York Times calls on its good old stand-by Joe Williams, executive director of Democrats for Education Reform and uses the euphemism "advocacy group" to describe a PAC financed by major hedge fund managers. David Sirota summed them up: Corporate education "reformers'" self-interest ... means advocating for policies that help private corporations profit off of public schools, diverting public attention from an anti-poverty economic agenda, and busting unions that prevent total oligarchical control of America's political system. In short, it's about the profit, stupid. Miffed that there was a lot of hot air about Race to the Top but little serious questioning of this radical federal deformation of what should be local school policy--and that the "other guys" got all the press--I took a look. This meant reading some 700 articles on the subject of RTTT and the Common Core standards published between mid-May 2009 and mid-July 2010. In an article for Extra! "Who gets to speaks about what schools need? Race to the Top and the Bill Gates Connection," I showed which "independent experts" reporters called upon to explain these programs. The national press called on Joe Williams and his DER cohort Charles Barone over 40 times for comment on education policy. Of the 23 experts quoted five times or more, 15 have connections with institutions receiving Gates funding and 13 with strong charter advocacy institutions. Remember that just two years ago when attempt was made to introduce a "Dump Arne Duncan" resolution at the convention, NEA operatives did not allow it to reach the floor. You will recall that during the Chicago Teachers Strike Dennis Van Roekel traveled with Arne on his bus tour. On September 19, 2012, NEA sent out a press release about this bus ride. Sure, I'm glad the NEA passed the resolution, but let's recognize it for what it is: window dressing. Curmedgucation blog makes the essential point: Duncan is a spokesperson for a product. He doesn't run the company, and he doesn't build the product. Duncan is the batboy for the team. Democrat loyalists with their heads in the sand who like to think that President Obama just needs a better education chief are delusional beyond belief. Duncan is spokesman for the Obama/Business Roundtable product. The long partnership between Democrats and teachers' unions has frayed in recent years as the Obama administration has pursued policies that many teachers oppose, including performance ratings that link student test scores to evaluations and decisions about promotion or firing. But the dissatisfaction hit a new level late last week when the National Education Association, the nation's largest teachers' union, with almost three million members, passed a resolution at its convention in Denver calling for the resignation of the secretary of education, Arne Duncan. Dennis Van Roekel, the departing president of the union, said the resolution passed in a very close vote among the 7,500 delegates. Although delegates have presented similar resolutions in the past, this is the first time the measure has passed. "I really do believe this is about something much bigger than Arne himself," Mr. Van Roekel said. He said "frustration and anger" has mounted at the use of high-stakes tests in teacher evaluations. Mr. Van Roekel added that teachers were angered by Mr. Duncan's supportive response last month to a judge's ruling in California that teacher tenure laws deprived students of their right to an education under the State Constitution and violated their civil rights. 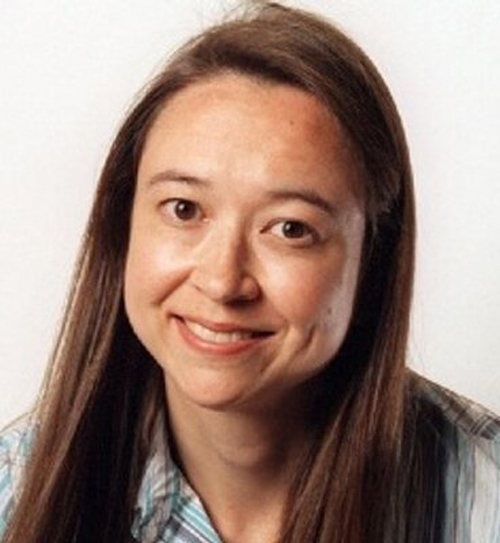 Reporter Motoki Rich (above) has replaced Sam Dillon as the official propagandist assigned by The New York Times to produce "news" stories favorable to U.S. Secretary of Education Arne Duncan and the Obama administration's corporate education reform policies. Rich's July 9, 2014 story quoting Joe Williams of the Hedge Fund "Democrats for Education Reform" (DFER) and ignoring the massive dislike of the Obama education policies among millions of American teachers is typical of the propaganda-as-news policies set by the Times since December 2008, when Barack Obama and Arne Duncan sat in a classroom in Chicago's "turnaround" Dodge ("School of Excellence") to announce that Duncan, who has not teaching or other public school experience except as an executive in Chicago and now across the USA, would become Obama's pick for the Cabinet post.Analysts of labor politics said the resolution represented a watershed between the Democratic Party and teachers' unions. "Who would have predicted 10 years ago that a Democratic administration would pursue an agenda and teacher policies that are so vehemently opposed by the union?" said Patrick McGuinn, an associate professor of political science at Drew University. "It's a Nixon-goes-to-China kind of moment." Mr. Duncan briefly answered questions about the resolution during a media briefing at which he released the administration's proposal to assign more effective and experienced teachers to low-income schools. "I always try to stay out of local union politics and I think most teachers do, too," he said, adding that the administration "had a very good working relationship with the N.E.A. in the past." He said he looked forward to working with the association's new president, Lily Eskelsen García. Since the National Education Association began endorsing presidential candidates with Jimmy Carter in 1976, the group has always backed Democrats. But at the state level, both the N.E.A. and the American Federation of Teachers, the country's second-largest teachers' union, have contributed to the campaigns of Republican lawmakers -- even those considered quite conservative -- who opposed tenure changes or test-based teacher evaluations. Ms. Eskelsen Garcia has indicated her interest in continuing to reach out to Republicans. She has also spoken out against using standardized testing to evaluate teachers. Teachers who oppose the administration's proposals said Democrats had taken them for granted for too long. "We're not getting anything for it politically," said Anthony Cody, a founder of the Network for Public Education, a political action group, who retired after 24 years as a teacher and coach. The American Federation of Teachers meets for its annual convention in Los Angeles starting Friday. Local affiliates submit resolutions before the convention, and none currently call for Mr. Duncan's resignation. The group's president, Randi Weingarten, said in an email that "there's plenty of opportunity for members to amend resolutions, so you never know what will happen on the floor." Democrats who embrace the changes pushed by the Obama administration said the resolution showed the waning influence of the teachers' union. "The Democratic Party used to outsource its education policy to the N.E.A.," said Joe Williams, executive director of Democrats for Education Reform, an advocacy group that supports test-based evaluations and changes to tenure. "The Duncan vote," Mr. Williams said, "made them look like the lunatic fringe. It's not exactly the way you convince the public that you've got a good, credible idea." Newly elected NEA President Lily Eskelsen Garcia "talking a more Ravitch-esque public line." The Obama administration�s education reforms have been almost completely absent from the national political debate because neither Party has an incentive to talk about them. Republicans don�t want to admit that Obama has carried out policies � more charter schools and teacher accountability � that they have spent years endorsing. Democrats don�t want to call attention to an issue that alienates teachers unions, a core element of their base. And teachers unions themselves don�t want to force their own members to choose between the union's agenda and Obama's. But the unions are growing increasingly obstinate in their opposition of the sorts of accountability and pressure that Obama has helped bring upon them. Last week, the National Education Association held a convention where it elected a new president, Lily Eskelsen Garc�a, and also officially called for the resignation of Obama�s secretary of education, Arne Duncan. The delicate balancing act within the Democratic coalition is beginning to fray. The main vehicle for Obama�s education agenda is Race to the Top, a portion of stimulus money it used as a lure to encourage states to overhaul their schools, and which produced sweeping changes. (That Race to the Top was tucked into a massive bill that passed very quickly, in the midst of an economic calamity, further obscured the scope of Obama�s agenda.) That revolution has continued to proceed, often carried out by a cadre of center-left education-policy reformers allied with the administration. The reformers, citing evidence that good teachers can teach the same class of students dramatically more than a poor teacher can, have introduced new methods to bring talented recruits into the teaching profession and to weed out ineffective teachers. They have also encouraged the spread of public charter schools, which experiment with new pedagogical methods. One of the most effective innovations used by the best charterschools is a longer teaching day. More school time has been found especially helpful for low-income children, who receive less academic support at home. In Washington, D.C., school chancellor Kaya Henderson has made longer school days a priority, and urged teachers to embrace it � not only will they be paid more directly for their additional teaching time, but the likely improved student outcomes will also increase teachers' bonus pay. The Washington Teachers Union has blocked Henderson. The leaders of the teachers unions have generally taken care to placate the demands of their most implacably anti-reform members without opening an irreparable breach with the administration. The unions have strong, clear-headed reasons for their caution. However strongly they disagree with Obama and the education reformers about the design of education and teacher pay, they do agree on the principle of paying teachers more. This is in contrast to Republicans, who generally support all the reformers� accountability measures and lower public budgets as well. And the leaders recognize that the hard-line unionist position � tenure rules that make it impossible to fire even the worst-performing teachers � are nearly impossible to defend with the public. As the leaders of the unions have equivocated, hard-liners have increasingly agitated for more direct confrontation. The leadership of this movement has fallen to Diane Ravitch, formerly a right-of-center education activist who has converted to the cause of teachers-union absolutism with an evangelical fervor, maintaining an almost superhuman schedule of public speaking and prolific blogging. Ravitch has depicted education reform as a plot by corporate elites to privatize schools and destroy unions. If charter schools claim to help poor children by providing longer school days, then Ravitch is certain that longer school days cannot work. Having identified their enemies with the cause of pure evil, Ravitch and her fellow hard-liners have taken to defending not only the practice of paying teachers by length of service, but the structure and form of the school day (created in an era of stay-at-home mothers and designed around the summer harvest) as a standard of perfection that must be defended absolutely. Ravitch and her allies have found the leadership of the unions disturbingly faint of heart. The pressure has dramatically intensified. One precipitating event is a shocking ruling, in a case called Vergara v. California, that has justifiably panicked opponents of the reform. The case, brought by school reformers on behalf of low-income students, charged that tenure rules (which make the firing of incompetent teachers nearly impossible) discriminate against poor students, who are far more likely than affluent students to have ineffective teachers. The results of the NEA convention reflected Ravitch�s militance. Not only did the union officially call for Duncan�s resignation � a measure that was introduced, but failed to pass, in each of the last four years � its new president Lily Eskelsen Garc�a, is taking a more Ravitch-esque public line. The flavor of her rhetoric can be seen in this Politico interview, in which Garc�a calls value-added measures (which gauge teacher performance) �the mark of the devil,� and plans to �further shift the union away from its longstanding and reflexive support of Democrats� (this is the reporter�s phrasing). The notion of an alliance between teachers unions and Republicans may sound preposterous, but it is Republicans who are leading the charge against Common Core teaching standards. Ultimately, the union backlash is likely to be channeled into the 2016 Democratic primary. Of the various sources of liberal dismay that may be brought to bear upon Hillary Clinton � Warren-esque concern with inequality, unease with the Clinton�s hawkish record � the most focused and organized may well be the cause of the unions. �Supporters of public education must rally and stand together and elect a president in 2016 who supports public schools,� urges Ravitch. This argument will be heard in Iowa. Rumor: arne motion might come up on the floor.